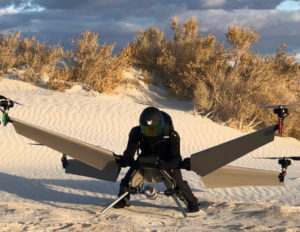 Deseret Unmanned Aerial Systems (UAS) recently signed a memorandum of understanding (MOU) with ElectraFly, a Utah startup developing a single-person hybrid-electric multi-copter which has the potential to revolutionize the unmanned aerial systems (UAS) industry. Under the agreement, ElectraFly will begin flight testing on Deseret UAS ranges early next year. This watershed moment showcases the strong collaboration between Utah’s state and local governments and its private sector UAS companies. Founded in 2017, ElectraFly is an aviation company building a hybrid-electric personal flying vehicle. It aims to increase lift capacity and flight times for multirotor aircraft (i.e.- aircraft that can take-off and land vertically) of virtually any size. Its innovations aim to enable multirotors to carry a meaningful load, including personal transportation, supplies, and package delivery. Early personal flight vehicles are operated by a pilot who possesses extensive training and expertise. They are limited in how far they can fly and how heavy their payloads can be. Inefficiencies exist in design, energy use, and battery size. ElectraFly hopes to change that with a prototype that is positioned between technologies like a personal jetpack and a large, helicopter-like air taxi. Read more…….